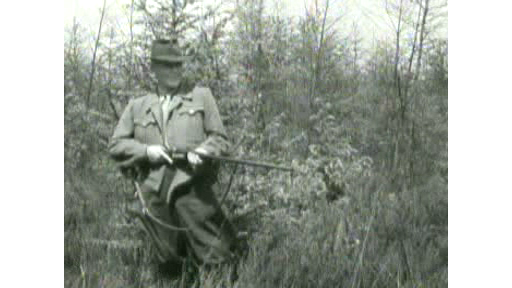 A hunt on wild boar, led by game warden Aarts(? ), is held in the Drunense Duinen. SHOTS: - A large group of hunters, beaters, journalists and photographers receives instructions from the game keeper; - the company goes to the hunting grounds; - hunters take their positions on the edge of the forest and load their rifles; Aarts fires the starting shot in the air; - beaters set off and move through the grounds whilst making noise; - hunters wait, rifles ready, in vain for wild boar; - a wild boar scratches about in a cage in a zoo.